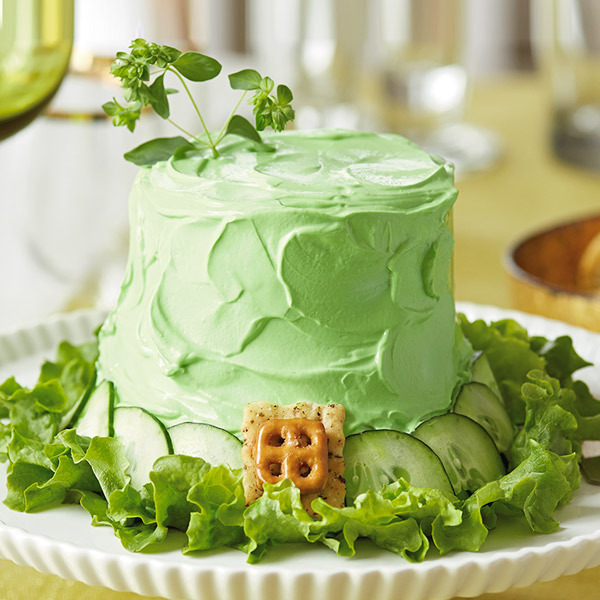 It is easy being green when you can serve up a delicious and delightful Leprechaun's Lucky Hat Cheese Ball to celebrate St. Patrick’s Day. This fun and festive cheese ball appetizer is sure to get a tip of the hat from your party guests. Cream cheese, smoked Gouda and chives form the base of this deliciously dippable cheese ball recipe, while green leaf lettuce, cucumber slices and a sprig of herbs add the perfect finishing touches. In the bowl of an electric mixer, combine cream cheese and smoked Gouda. Mix until well combined; then add chives, parsley and black pepper. Stir until blended. Transfer cheese mixture to a large piece of plastic wrap and form into a tall hat shape. Refrigerate for at least 4 hours or overnight. Arrange lettuce leaves on serving platter in a round shape so you have a nice brim for the hat. Remove the plastic wrap from the cheese mixture and place the cheese in the center of the lettuce leaves. Using an offset spatula, smooth out the surface of the cheese. “Frost” the cheese hat with the green sour cream. Finish the hat with a row of semicircle cucumber slices at the base to make the hatband. Add the cracker and pretzel on top of the band for the buckle. Top the hat off with the herb sprig.